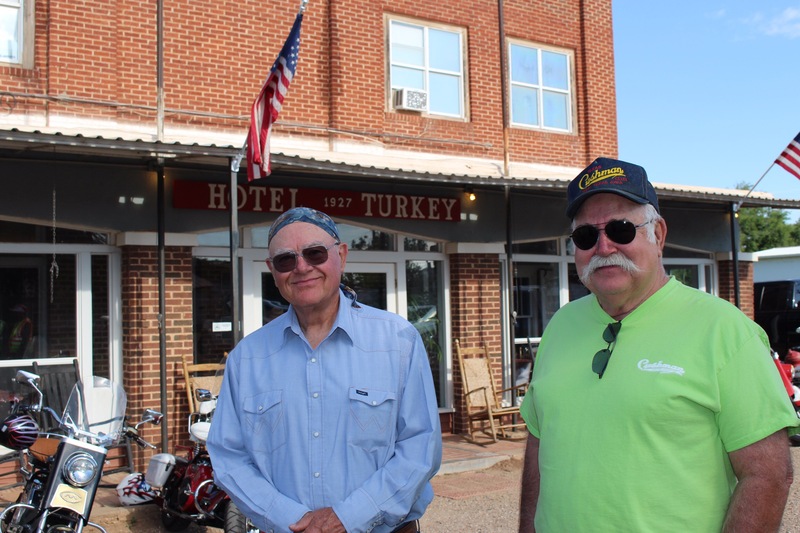 Turkey, TX May 2017 | Texas Cushman Club, Inc. 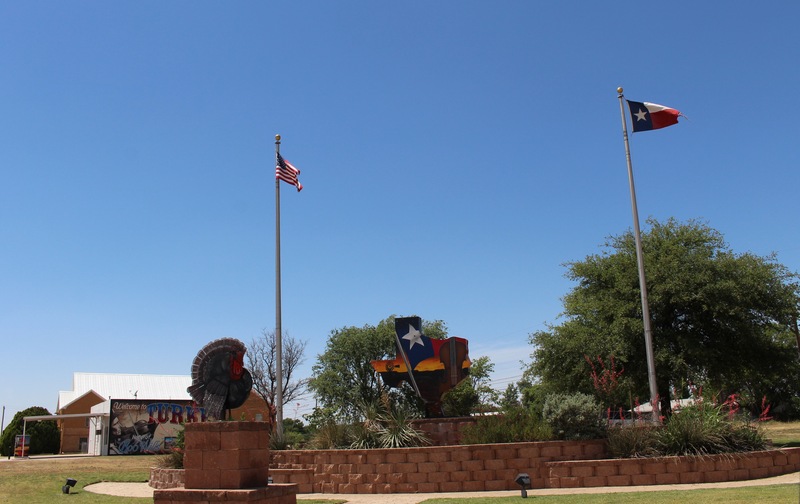 This is the entry site of Turkey, TX. “Ah-Haa” is a sound of pleasure that Bob Wills made popular in his music. Turkey and the area made us want to join him with a big “Ah-Haa”. The weekend went well. Martin Stafford and Don Henry planned this weekend and rides. We stayed at Hotel Turkey’s accommodations. Several had rooms in the hotel and the rest used their RV campsites. 9 scooters on the road to Clarendon through the Caprock landscape. Keith Floyd’s shop in Clarendon. He provided a delightful tour of the Donley County Courthouse, a lunch, and the opportunity to meet his local friends and neighbors. Front row: Margaret and Armando Trevino, Chrysti Love, Gary and Betty Mathis, Raymond Love, Sharon and Pete Henderson. 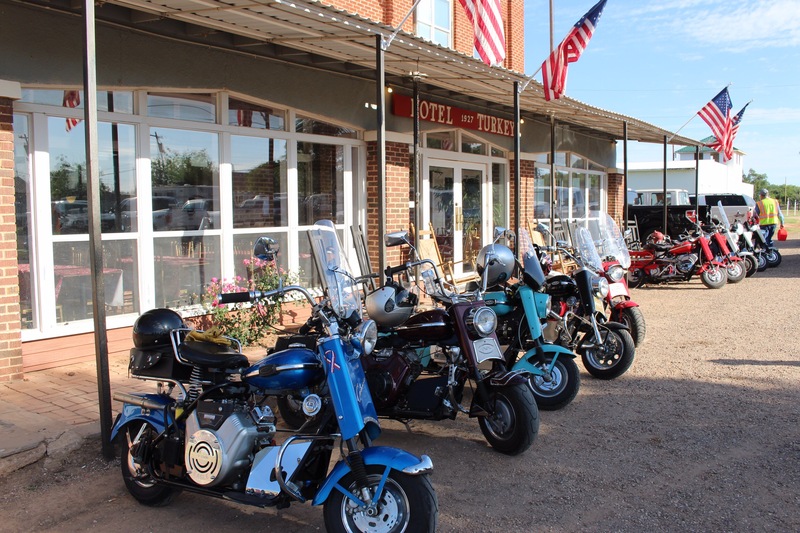 Saturday, 8 Cushman scooters headed for Childress. Lunch at K-Bob’s in Childress. Cooling in the shade at Estelline on the way back. Notice that Ted Grisham joined the group. He drove from Midland “because Martin likes to RIDE”. Need a scooter unloaded? Look at all the willing men. Thanks, Margaret Trevino, for the pictures. Just wish I could have been there.